Have you made an email blooper or blunder that caused you to “die a thousand deaths”? Congrats! You have a pulse. Unfortunately, one email mistake could end your career or destroy your life. Think back to the first rule you learned when you went online: The Internet is forever—if you don’t want it broadcast on the 6 o’clock news, don’t put it out there. The “lose your job” part is obvious, but what about the “lose your life” part? Imagine you’re in the midst of a custody battle for your child. Now imagine that an email blasting your soon-to-be ex ends up in the wrong hands. Can You Top This One? I almost lost a company, a conference and a premier sponsor by mistakenly clicking “Reply to All” instead of “Reply.” It was 4:00 o’clock in the morning, and I was exhausted, having worked through the night. I co-owned a conference company at the time, and our sponsor was due to make a monumental announcement at our upcoming conference that would change the course of software user assistance. My sponsor posted a tasty teaser about the secret to the help-author mail list. I meant to reply to him, but instead of hitting “Reply,” I hit “Reply to All,” and broadcast the secret to the entire mail list of help authors and tech writers, many of whom were already enrolled to attend the conference. I didn’t notice the mistake until I began receiving private emails from friends and colleagues on the list. My sponsor was on Pacific time, two hours behind me, so for the next few hours, my heart was bouncing around my chest. My hands and voice shook, and nothing could calm me until I spoke to the sponsor. Luckily for me, he has an incredible sense of humor, and what could have been a disaster is now something we laugh about—20 years later. I’m sure you can understand that having made that mistake once, I check the “To” and “cc” fields before sending each email. What Is It They Say About Assumptions? Many email mistakes are rooted in the assumption that colleagues, vendors, superiors and acquaintances are friends. They aren’t—unless they are. It’s important to understand the distinction. If you have no “feel” for people, it’s best to ask yourself if you could call the person in the middle of the night for help. If you can, you’ve got a friend. All others fall into the former groups. Another bad assumption is that emails are the equivalent of text messages. They aren’t. Follow along as we review many of tragic mistakes that are all too common when using email. Omitting a subject line—without an appropriate subject line, your recipient might not open the email. This not only includes a blank subject line but also an old subject line, where you keep responding to an old email even though the subject has changed. It makes finding something in an old email difficult. Forgetting a salutation—common courtesy dictates that you say, “Good morning, Jim, “Dear Jane,” or, “Hi, Kim.” If, after performing due diligence, you can’t find the recipient’s name, a simple “Good morning” will have to suffice. Falling for SMS Syndrome—proper spelling, grammar and punctuation are essentials of business communication, regardless of what form they take. Unless you are texting from your phone, write in complete sentences. It only takes a few seconds to check spelling and grammar, so make it a habit. Disregarding tone—keep your emails in line with your corporate culture—a startup and a downtown law firm have very different cultures. Spreading information (or gossip)—it is never OK to assume that you can forward an email without permission. In the unlikely event that you forward something, remove the header that contains the senders name and address, etc. Assuming your email is confidential—assume that others will see your email. The same night that I made the email blunder described above, I wrote a rant that ended up in the wrong (thankfully friendly) hands. I went back and checked the email I sent, and somehow, the wrong person received the email. Strangely, the original recipient never received the email. How did this happen? No clue! Lesson learned—never put anything in writing that you don’t want the world to see. Pick up the telephone if you don’t want it broadcast to the world. Sending an email when you’re angry—cool off before sending an angry email. Here’s one way to do it: Type your diatribe in Word and save it. Sleep on it, or give yourself a few hours to cool off. Go back and edit it from a diplomat’s point of view. Then, drop the text into an email. At the very least, do not fill in the “To” line, and save the draft until you can think clearly and give it a proper edit. Responding too quickly—when you check your email in the morning, read through all emails from a person before responding. Circumstances change, and you’ll have a better idea once you read through all of them. Leaving off a signature line—your sig line should appear on initial emails, but leave it off subsequent replies. Sending spam—in a workplace environment, forwarding Sad Cat Diary to your email list is not only improper, it can get your fired. Have I forwarded this to colleagues? You bet—I’ve worked with one for five years and another one for two years, and both are cat guardians. Forgetting the Internet is forever—“All your emails are belong to us.” In the workplace, your email lives forever on the server—FOREVER! Your superiors can review them at any time (like right before an evaluation), and they can and will be used against you if the business ever wants to pink slip you. 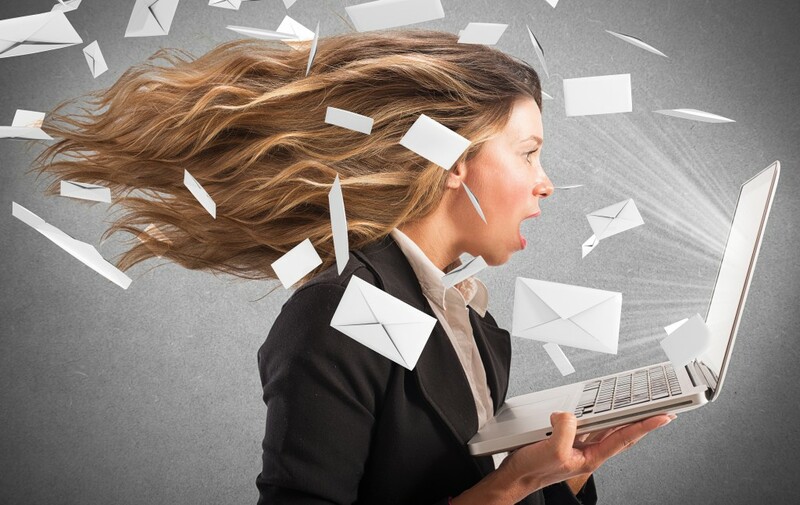 Dumping your brain—email is not meant to be a mind dump. Brevity rules, and no one has the brain cycles to read a tome, so get to the point. Hitting “Send” too soon—it’s easy to get distracted, and if you multitask (talking on the phone while writing an email comes to mind), you could inadvertently hit “Send” before the email is in top form. Using “bcc”—what if you send the bcc to the wrong person? Or worse, what if the bcc recipient replies to the original person to whom the email was addressed? OUCH! I don’t trust the “bcc” function, so I don’t use it. There are other ways to let someone know you’ve sent an email. Writing thoughtful emails is not rocket science. If you address the email after you’ve edited it and just before you hit “Send,” that will fix most of the common email bloopers and blunders. Mother taught you to “think before you speak.” That was great advice, and it translates into all forms of communications, not just business communications. Email is transported through the Internet, so refer back to the rule—the Internet is forever. It’s impossible to repeat the rule too many times. If you have an email blunder that you’ll admit, feel free to share it on our Facebook page. The easiest way to learn is from others’ mistakes instead of from our own. This entry was posted in Personal Finance on April 18, 2016 by admin.